This is the next installment of my chapter-by-chapter review of Rev. 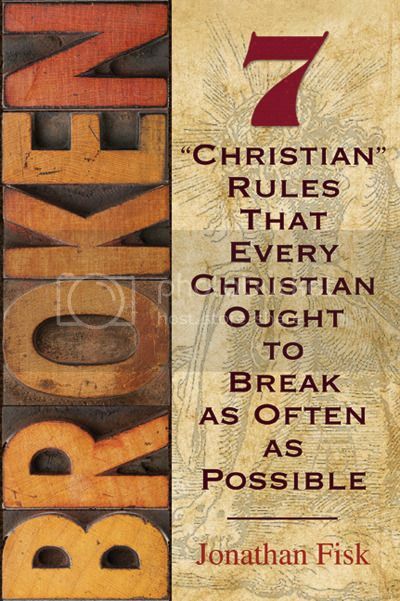 Jonathan Fisk's Broken: 7 "Christian" Rules That Every Christian Ought To Break As Often As Possible so if you missed the introductory piece, then please start there, and then follow that up with the other Chapter Reviews previously published in this series. It's been interesting for me to go back and reread one of the first distinctly Lutheran pieces of writing that I had ever put my hands on (even before getting my own copy of the Book of Concord, Small/Large Catechism, and Lutheran Study Bible) back when I fully embraced becoming a Confessional Lutheran. I had forgotten just how life-altering and radical it was for me at the time to go from a sort of "American-Evangelical-Though-Self-Identifying-As-A-Non-Denominational-Spiritual-Island-Unto-Himself-Because-All-Denominations-Are-Bad" type of Christian to a Confessional Lutheran who was truly starting to adhere to "the faith that was once for all delivered to the saints" (Jude 1:3), which is always Christ-centered and cross-focused, because it constantly proclaims Christ crucified for the sins of all mankind. For that reason, I've fallen in love with this book all over again and I hope that these meager Chapter Reviews will hep to explain all the reasons why while also enticing you to pick up a copy for yourself as soon as possible. Before we get to our next Chapter Review, however, let's quickly review Pastor Fisk's main purpose in writing this book. Like I said once before, that's quite refreshing. It was incredibly refreshing when I first read it and it's incredibly refreshing to read it again now almost 3 years later. Ok, but what about Chapter 5? What is the next lie that Satan uses against us so often? "Never #5 Never follow a rule that has to start over (again and again and again) again." So Chapter 5 introduces us to the fifth rule that every Christian ought to break as often as possible -- Pragmatism, or the incorrect belief that God's blessings for the Church can be received by us only after we have first done (You Fill In The Blank Here). "IfWeCanJust" is a good label to use for those believers committing this error/sin, which is nothing more than the worship of Ecclesiology (a fancy-schmany church word that refers to the "stuff" that makes a church into Christ's Church or into "the Church"), that is, the worship of our efforts to "be" Church. In short, it's the far too common mentality that "IfWeCanJust (You Fill In The Blank Here)" in our local congregations today, then we will see God moving in the Church. I like that Rev. Fisk says that "it's the fifth rule not only every Christian but every congregation and every denomination out to be absolutely on the ball about breaking as often as possible" (page 152). The danger here -- if it isn't already quite obvious -- is that zealous Christians need to make sure their zeal doesn't get the best of them. My goodness, rereading this chapter makes me want to type entire paragraphs here in this Chapter Review post, but I don't have the time, don't want to ruin it for you if you haven't read this book yet, and don't think Rev. Fish or CPH would be too happy about that. Still, for me, personally, this criticism of Pragmatism and the "IfWeCanJust" mentality really resonated since I still encounter it weekly from those at our former church and at the Lutheran Day School my kids and nephew attend. It never ends either! No matter how much you try to talk to people about the dangers involved in this kind of approach to things, it always seems to fall on deaf ears, because if it makes sense and sounds practical, then it must be a-ok with God. Some of you might be familiar with this sort of thing if you've ever encountered the "Five Two" para-ministry too. It is explained in the section titled "Lycanthrop(church)ology And The Rise Of The W(h)ereChurch" that this is a direct response to our twisted belief that Christ's Church is "sick" and that it's up to us to "fix" her no only for ourselves, other, and the non-believing world, but for Jesus Himself. It's the height of arrogance, of course, and it completely ignores what Jesus said about His Church (Matthew 16:18). Sadly, it's always been this way, but we never seem to learn. The irony? Rev. Fisk points out that the truth is always old (Ephesians 4:11,24; Jude 1:3) though we often reject that notion for the "exciting" and "new" and adds, "Now, I don't think for a moment that anyone really wants to kill the Church, but I am convinced that the IfWeCanJust churchology is a tradition of men doing just that" (page 157). From there, he includes a section he calls "Hooked On A Restoring" which focuses on this persistent desire for "Restoration" or a "New Reformation" that a majority of Christians insist the Church needs. The assumption and mentality today? The Church that Jesus started failed, so it is up to us to bring it back. In this way, Restorationism is the single shared tradition of Americanized Christianity, the belief that we, over here in this corner, by getting back to "IfWeCanJust (You Fill In The Blank)," are turning ourselves into the Church Jesus always wanted us to be. This need is ingrained in our habits like a theological DNA, a hyperobsession with starting over. Again and again, with all the hindsight of an amnesiac, we declare that everything that came after the apostles but before us has obviously failed...BUT! WE WILL BE THE ONES TO GET IT RIGHT. IfWeCanJust." The rest of this chapter is rich in poignant and persuasive arguments against the "IfWeCanJust Churchology" we see so often today. It talks about "The First Path: The Idolatry of Order" or the the belief that "IfWeCanJust find the right structure" for our church government, then the mission can really get done! Then there's "The Second Path: The Idolatry of Worship" or the belief that "IfWeCanJust change the liturgy" and perfect it, get it right, bring it back, take it forward, then the churches will at last become the Church God wants them to be! There's even "The Third Path: The Idolatry of the Leader" or the belief that "IfWeCanJust find the right way to organize and the right way to worship and find the right person to bring the two together," then we will truly be God's assembly or the real Church! The rest of that section is an incredibly well-written analogy. Again, I really wanted to keep going, but I don't want to ruin it for you if you haven't read this book yet. Rev. Fisk spends another ten pages attacking this tired and twisted idea that we need to constantly change Christ's Church or "reinvent" it somehow in order to remain relevant. It's easily one of my favorite chapters in the entire book.